High school football has been in gear for the past several weeks, but the match-ups are getting better and better. This week looks to be one of the most interesting of all the weeks of the season. Last week left a bitter taste in the mouth for schools like Berkeley and Ashley Ridge, who both succumbed to 4A schools. Berkeley lost at home to Summerville, but kept it competitive for most of the game. Ashley Ridge was blown out at Wando. West Ashley already has won more games than last year, beating James Island 26-20 in their rivalry game. West Ashley now faces Ashley Ridge this week. Stratford had to gut it out at Sumter, but they pulled a win out. Fort Dorchester had a nice 3 touchdown win at Cane Bay. They also face each other this week in one of the top games of the week. Goose Creek blew out Colleton County 77-30 last week. This wasn't even the most points scored in the area though, as Palmetto Christian put a 78 spot on Lincoln, winning 78-46 in one of the wildest games you'll see. Hanahan may have had the most impressive win last week. They took the short ride to Daniel Island and only shut out Bishop England at home, 35-0. They have a bye this week. Quick hits: James Island Christian (2-0) at First Baptist (0-2)- This game is the first all-James Island derby in a long time, since James Island and Fort Johnson became one. JIC won 74-24 last week, and have a former assistant coach at The Citadel, Chad Wheeler at the helm. Beaufort (2-0) at Groves (0-1)- A improved Beaufort team, who shut out Aiken last week at Aiken, heads to the Savannah area to face Groves HS. The Eagles hope that they won't be like the Bluffton team two weeks ago, who succumbed to South Effingham. C.E. Murray (0-2) at Timberland (2-1)- Timberland, after a convincing win over Cross last week, hosts a C.E. Murray team heavy with senior leadership. Bishop England (0-2) at Porter-Gaud (2-1)- This match-up is always interesting between the two largest private schools in the Lowcountry. Porter-Gaud has bounced back from their opening loss, winning last week in the final seconds at Heathwood Hall. Can Bishop England avoid a stunning 0-3 start? Georgetown (2-0) at James Island (1-2)- Georgetown, a team who has already upset Conway this year, and is receiving votes in the 3A poll, comes into James Island to face the Trojans. The Trojans had a near comeback last week at West Ashley, but can they bounce back? 5. Wando (2-1) at Colleton County (0-2) (Thursday): Wando has a new QB system, using two QBs, Dalton Stubbs (a senior) and Bailey Hart (a sophomore). This worked last week, in a 45-26 win over Ashley Ridge last week. Colleton County on the other hand, was blown out, but they played very well in the beginning of the game against Goose Creek. The score was 7-6 Gators halfway thru the first quarter, and they even stunned Goose Creek with a fake punt. After one quarter, it was 14-12 Goose Creek. The rout was on after that, but the Cougars showed me a lot in that first quarter. Chris Collins has improved his Colleton County team a lot in the past couple of seasons, and has some good skill players. 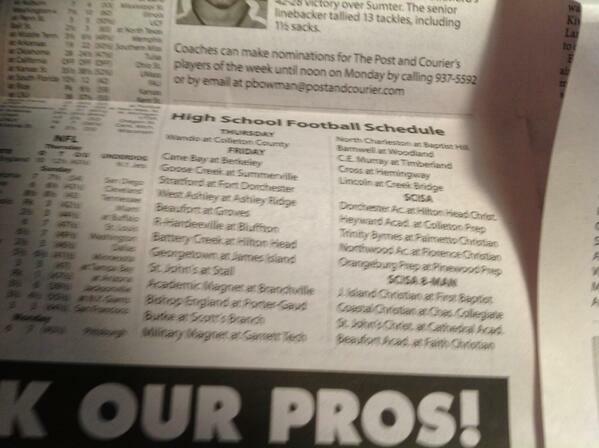 Wando cannot look ahead to hosting Summerville this week; if they do, Colleton County could end their losing streak. As a televised game, the fans will be pumped up in Walterboro. 4. Cane Bay (0-2) at Berkeley (0-2): This is a gut-check game for both schools. Cane Bay has scored just 14 points in their first two games against Summerville and Fort Dorchester, while Berkeley has played well in their first two games, but have come away with losses. Neither school, even though this is a non-region game, want to start 0-3. Berkeley fans will be very mad if Coach Jeff Cruce starts this season of hope with three straight losses. Berkeley does have an advantage playing at home in Moncks Corner, but Cane Bay will be wanting a win against one of their biggest rivals. 3. West Ashley (2-0) at Ashley Ridge (0-2): West Ashley has been a surprise so far this year. Two straight wins at home over good competition (Bishop England and James Island) have the fans excited on the west side of the Ashley River. The Wildcats though have not played a 4A opponent yet. Ashley Ridge has been blown out in their first two games, but gave Goose Creek a fight for about a half, only down 14-7 at halftime before losing 56-28. Now, they are at home against a team with something to prove. 4A football is a battle every week. Any team can beat anyone with the home crowd behind you. Ashley Ridge though hasn't won a home game since November 18, 2011 in the playoffs at Stratford. Last year, they didn't win a single home game but they went 4-3 on the road. Can the Swamp Foxes break the home hex? 2. Stratford (2-0) at Fort Dorchester (2-0): Almost any other week of the season, this would be the game of the week. But not this week. Stratford has had a lot to improve on from the last two games. Jacob Park had three touchdown throws last week to beat Sumter, while Fort Dorchester had another nice win, this time at Cane Bay. A big equalizer for this game is that it is at the Fort. 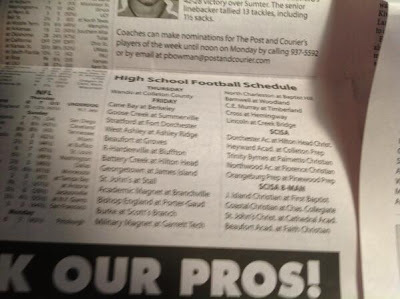 Fort Dorchester's home fans will be excited to get a shot at the Knights, probably their second biggest home game of the year behind the Summerville game. With Fort Dorchester's athletes, and if they can put pressure on Jacob Park, they have a chance to pull off the upset in North Charleston. 1) Goose Creek (2-0) at Summerville (2-0): This game probably is the biggest football game in the Lowcountry thus far this season. Summerville has had convincing wins over Berkeley and Cane Bay, neither a pushover. Goose Creek has wins over Ashley Ridge and Colleton County. The W over Ashley Ridge was a road win, but the Gators haven't faced an atmosphere like they will face in Summerville. Goose Creek has given up three returns for touchdowns already in the first two games, and only led Colleton County at home by 2 after 1 quarter. The Gators have to get a fast start on the Greenwave in order to limit the chances of QB Sawyer Bridges. This could be their toughest road game until the Stratford game, even though after this game they play three of their next five on the road. Summerville needs to control the ball, not make turnovers, and make some special teams plays in order to upset the Gators. This will be one of the best games of the state this week, and there will be a very good crowd.